When you have kids you start doing things you had never even thought of before. Most of these things include bodily fluids and sickness and other things I won’t detail here cause I would like it if you would keep reading. But there’s other things you do that you never had to before. Like share toys and food. Sometimes there’s one slice of the banana bread left that Max and I baked together. And, I’ll want to eat it smothered in butter along with a steaming cup of coffee. I usually back off and let the boy make a crumby mess with it in front of Saturday Morning Cartoons instead. My boy has learned by example that sharing is the best way to feel good about what you have and what others have as well. He’ll often offer me that last M & M from the bag or the final cookie from the box. The other day we were cruising CVS for absolutely nothing whatsoever and we paused at the Tooth Tunes display. 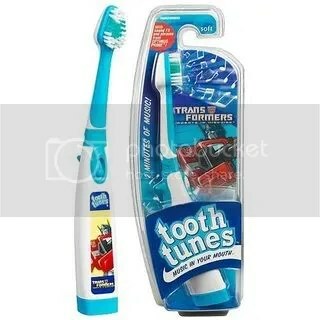 If you are unaware of what these are let me explain: They are toothbrushes that play a song for two minutes while you are brushing your teeth. It seems as though when you brush the music coming from inside your head. Last summer when they first debuted me and Max jumped at the idea. He got one with a song I have never heard of but mine was a daily reminder from Beyonce and her posse that I am indeed a Survivor. As we were looking through the newest songs that dental health had to offer I noticed one I had to have and could not imagine life without. omygosh…it’s a toothbrush! But…there was only one. What was I to do? I wanted it so badly but I was sure that Max needed in the worst way as well. What did I do? I snuck it up to the register and bought it for myself. Can I please tell you how awful I feel? I haven’t even used it yet. I How could I? Sticking that brush into my mouth with Optimus Prime ordering, “Autobots Transform and Roll Out!” while the theme song was playing seems like the most awesome way to get rid of the broccoli between my teeth. However, I cannot bring myself to do it. I am going to give it to Max when we get home today. It’ll be a good day for him. And If I remember correctly they had KISS’ Rock and Roll All Night brush as well. I can go back and get that one. Then everybody wins. This entry was posted in Blogroll, family, funner, happiness, health, Life and tagged CVS, kids, Optimus Prime, sharing, toothbrush, Transformers. Bookmark the permalink. I have to get one of those things, did they happen to have Spiderman? bc323827- No, I checked on Hasbro.com. AS of yet there is no spiderman version…but I have seen spiderman electric toothbrushes. If they had Led Zeppelin’s Stairway To Heaven I bet we would all have pretty clean teeth. That song is like 10 minutes! When I first read this, I thought the kicker to the story was that you and the boy were going to SHARE the frickin toothbrush! Now that would be quite disgusting. I’m glad you’re giving him the OP one and finding something else for yourself. Much better ending to the post! Awww…you’re a good mom! You know, those are the things your boy is going to remember about you, and he’ll pass them along to his kids too. Just think of the favors you’re doing for your future daughter-in-law, when her kids respect and admire her because you raised their dad right! Kudos to you! I see your dilema. I have not heard of such a thing. Who knew brushing could be entertaining? But as tempting as it would be, I probably would have caved into giving up the toothbrush as well. The double-stuffed oreos, however, will remain hidden in the back of my underware drawer…I’m not THAT nice of a mom. I love that your son offers you his last M&M. You must be a really good mom!